Create a stunning setup that lasts for years to come when you choose waterproof flooring in Akron, OH. At our local showroom, we carry a wide variety of materials for rooms of all sizes and styles. When you visit us for your flooring, you are sure to find something you love for every room. Shop with us today to discover waterproof luxury vinyl flooring from some of the top brands in the industry. When you are tired of the same old style in your home, choosing to replace your flooring is an easy way to make a big impact. However, it is important that you select the right material to avoid the need for expensive repairs and maintenance in the future. Moisture-prone areas like bathrooms and basements require a durable material that holds up to the threat of water. 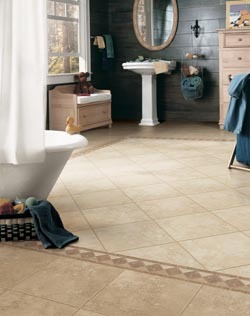 By choosing waterproof vinyl flooring, you will create a look you love in any room. Our collection of materials allows you to upgrade your space without the risk of stains, warps, and other damage. No matter what your style preferences are, you are sure to find something you love when you shop with us for your waterproof flooring. Create a stunning setup in every space by shopping with us for waterproof flooring. At our showroom, homeowners will find waterproof carpet, vinyl, and tile in styles that fit every taste. If you have children or pets, you already know the importance of choosing a durable flooring material. Waterproof carpet and vinyl products are made to hold up to regular use without the need for repairs and maintenance. At our showroom, our inventory includes options from top brands in the industry, including Downs H20 and Tigressa H20. Bedrooms, living rooms, and every other part of a home will stand out when it is outfitted with a new set of waterproof carpet or vinyl tile. The selection of materials at our showroom features endless options for any room in a range of styles and patterns. Once you choose the right flooring for your home, count on us for the waterproof flooring installation. We are available to perform a full installation in rooms of all sizes. Our experienced contractors work quickly and efficiently to deliver a top quality result to every project. Contact us in Akron, Ohio, to shop for new waterproof flooring for your home. Our selection of waterproof luxury vinyl flooring includes options for customers throughout the area.